Getting a lot more serious about adding a Bimota to the garage. I have a kink for special framed bikes. Mainly Honda powered ones, but I am realistic that finding a HB2-3 will be almost impossible. Mainly looking for something pre 2000s, but could be talked into almost anything. Closer to NY, the better. Open to projects, and bikes that have been sitting. Very much open to anything. Looking to tick this box. I think this may have been mentioned before but I would reach out to Bob Steinbugler at Bimota Spirit. Even if you don't see something you like, you can always reach to Bob and let him know what you are looking for. BTW, he's offering a very good deal on an SB8R with ultra low miles. If you like special framed bikes, SB8R is hard to beat. I don’t really value the “museum” bikes very highly. Not looking for a sculpture, already have a mini Bimota! I want a bike to use as a motorcycle. Have found bikes that sit for ever are a pain to start using. Superbike Universe has a YB7 that peaked my interest. There is that Tesi in VA, but the dealer is out of their mind on price. As with any rare bike it is all about timing. [quote="Jaguar"]I don’t really value the “museum” bikes very highly. I have a DB5R that is a "from the factory" track/race bike. 2015 CCS F40LW Am Mid Atlantic championship with old fart me (65 at the time) riding. 2nd and 3rd respectively in LWGP and LWSbk. Had a first gear low speed lowside in the pits and did some brain damage (No helmet, I was riding to tech.....dummy!) and broken bones. Have waited a year but doctor says no more racing motorcycles. Mild damage repaired and fresh custom (truly a professional custom car painter) red paint job. Very rare (I was told by Chris it was one of 6 brought to the USA) as a factory track bike. Fast, easy to ride. Ohlins front and rear. gradycanderson@aol.com if you are interested and want pics. Not cheap of course but not out of line for what it is. I don't NEED to sell it but saw your post and thought maybe I had found a potential good home for it. I had decided to keep it as a work of art but it BEGS to be back on track. Spectacular condition. Not a museum piece or trailer queen. A beautiful rider/racer. Proven "no excuses" Lightweight class (CCS) winner. Race wins at Daytona, Summit Point andf VIR. Bike is in Virginia a bit West of Washington DC. I have truck and enclosed trailer if that factors in for you. I bought my YB10 from Bob. He gave me a choice of two bikes he had at the time, a garage queen or a daily rider. I went for a daily rider level bike as I ride everything I own. Bob ended up going through the bike, new tires, battery, plugs, etc. He upgraded the rear sproket as well. I received a fully operational bike. if you really want something, you need to create the opportunity. Anyway, good luck in your search. 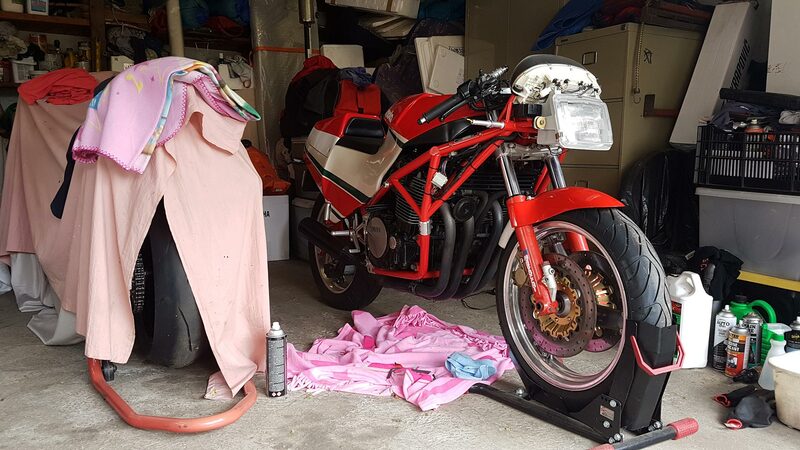 Beautiful steel framed Bimota with FJ1200 engine... old school beauty, here is mine half undressed..
YB5 #130, YB5 #196, SB6 #949, Laverda RGS Executive, Laverda RGS Corsa. Ahh! Not another happy owner/ buyer! Where did this one come from? Not as many bikes as I would like and already too many to keep up with!